Disillusioned with her marketing job after college, Alexander dove into the humanitarian aid community, hoping to find a sense of purpose that the corporate world could not offer. She arrived in Rwanda in the aftermath of the 1994 genocide as an eager intern, ready to contribute, but unsure of what to expect. The world she encountered in the field was dramatically different from anything she could have imagined. It was messy, chaotic, and difficult—but she was hooked. 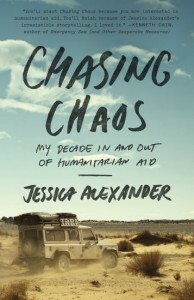 In Chasing Chaos: My Decade In and Out of Humanitarian Aid, the former Fulbright scholar reveals the realities of life as an aid worker from managing a 24,000-person camp in Darfur to contributing to the aid efforts after Haiti’s earthquake in 2010. Alexander also writes about alcohol-fueled parties and fleeting romances, burnout and self-doubt, and the struggle to do good in places that have long endured suffering. Chasing Chaos chronicles Alexander’s frustrating battles against corruption and inefficiency, but also her victories in the field. From wide-eyed and naïve newcomer to hardened cynic and, ultimately, to hopeful but critical realist, Alexander shows us not only the seemingly impossible challenges, but also the moments of resilience and recovery. Book signing to follow. At the event, there will be an opportunity to make a monetary donation to the American Jewish World Service effort to help victims of Typhoon Haiyan.